Thundering out of the Chaos Wastes on roughshod hooves ride two mighty champions of Tzeentch! Here’s a work in progress on my unit of Chaos Knights. I decided to go to town with these guys and try some new painting techniques to convey the eldritch glow of their Ensorcelled Weapons and Marks of Tzeentch. I referred to the excellent tutorial by Garfy on Tale of Painters to get the glowing NMM style I wanted. The Doomknight is gifted with a gribbly arm mutation bestowed upon him by his patron god. I converted this from 40K Possessed arm and a few of the mini tentacles which you can see poking out from under his pauldron. 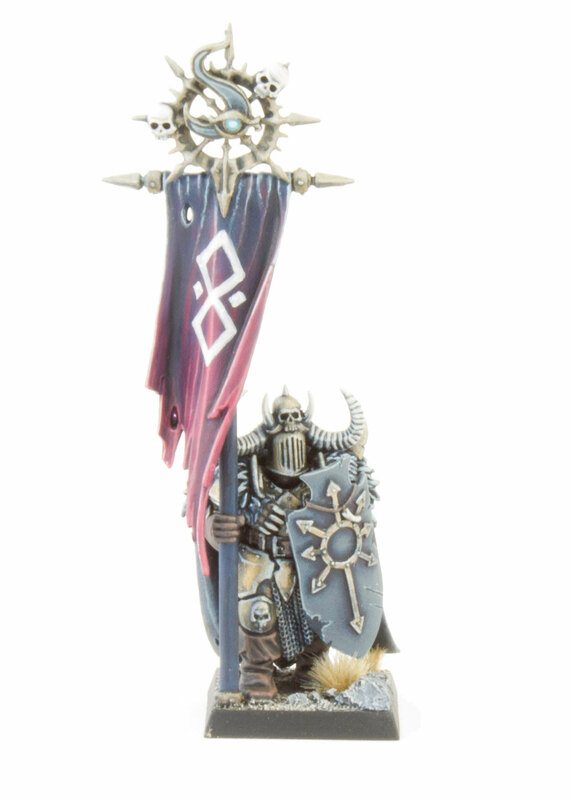 The Standard Bearer is a personal favourite of mine. Once again I used a bright magenta to mark out the command group models and used a converted icon of Tzeentch from a 40K Chaos Space Marine kit. To paint the War Steed I blocked in the skin areas with Charandon Granite and washed it back with Drakenhof Nightshade. Mid tones were picked out in the base colour and then hightlighted with glazes of Stormvermin Fur followed by a thin edge highlight of Baneblade Brown. The longer hair was highlighted with Rackarth Flesh and Pallid Wych Flesh instead. The freehand on the banner was inspired by the runes found on the Chaos Chariot and Chaos Warshrine kits. I wanted to use this to tie together different parts of the army. I use runes and apotropaic symbols on my models to convey the fickle aura of sorcery surrounding those that bear the Mark of Tzeentch. When this kit came out I was blown away by it – the War Steeds looked straight out of an Adrian Smith painting. Compared to the new Chaos Chariot though, it’s starting to show its age. A close up of the Doomknight’s crystalline weapon wreathed in claws and tendrils. 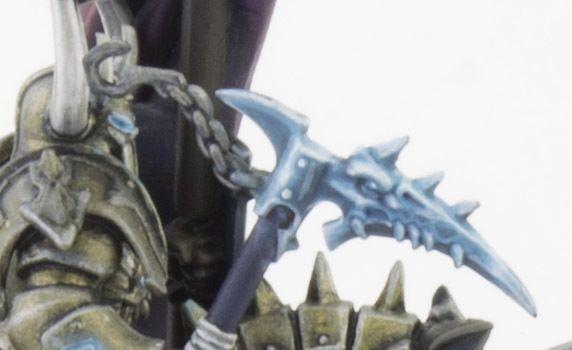 As a Champion of Tzeentch I imagine this to be constantly shape-shifting from sword to glaive to axe, his body wracked with convulsions as the power of change surges through him! The Standard Bearer carries a vicious pick imbued with the daemonic essence of a Lord of Change. Run For Your Lives! 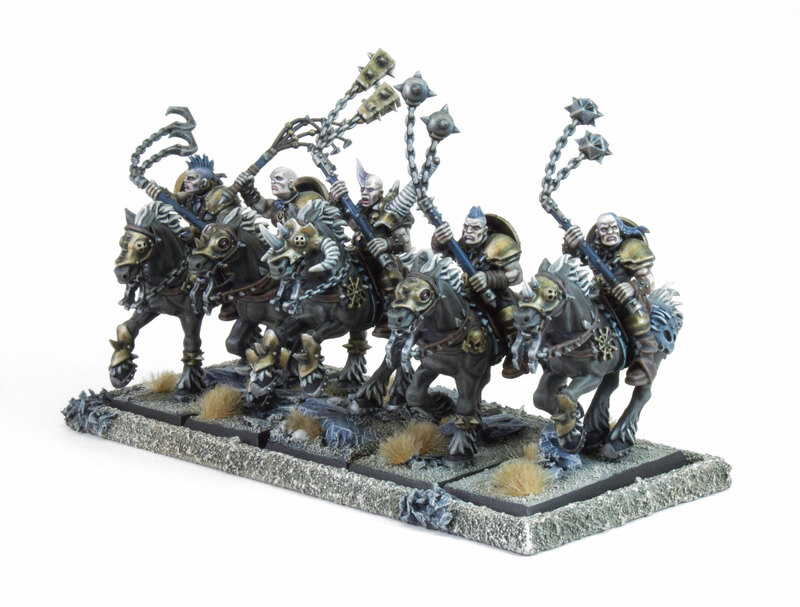 Chaos Marauder Horsemen! 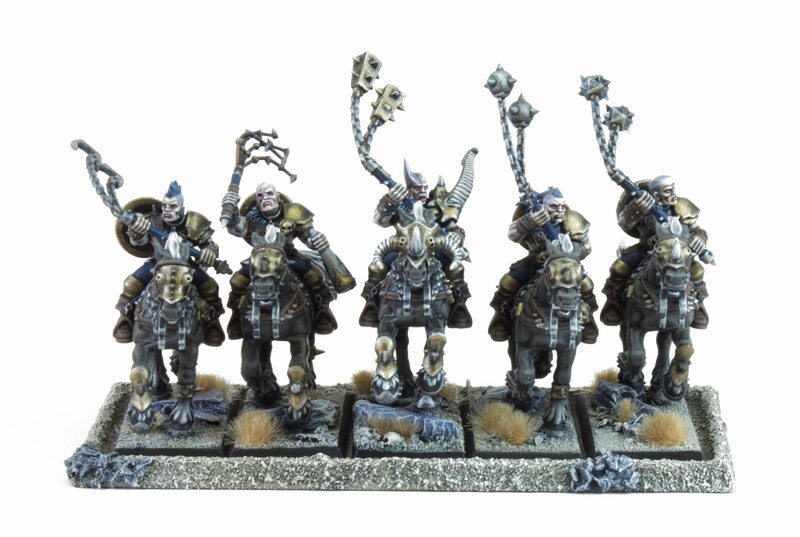 Another unit completed – this time it’s a roving band of Chaos Marauder Horsemen. These brutal raiders are the vanguard of my army, riding ahead with Barbarian Flails to bludgeon down any who would resist the tide of Chaos! Despite painting these miniatures in my usual Tzeentch army scheme, the exposed skin on these guys meant I could try out some new colours. I used Rakarth Flesh shaded with a very thin wash of Drakenhoff Nightshade and then glazed up with Pallid Wych Flesh. At this point they looked a bit like zombies so I applied a thin glaze of Reikland Fleshshade to add some much needed warmth and humanity to the palette. 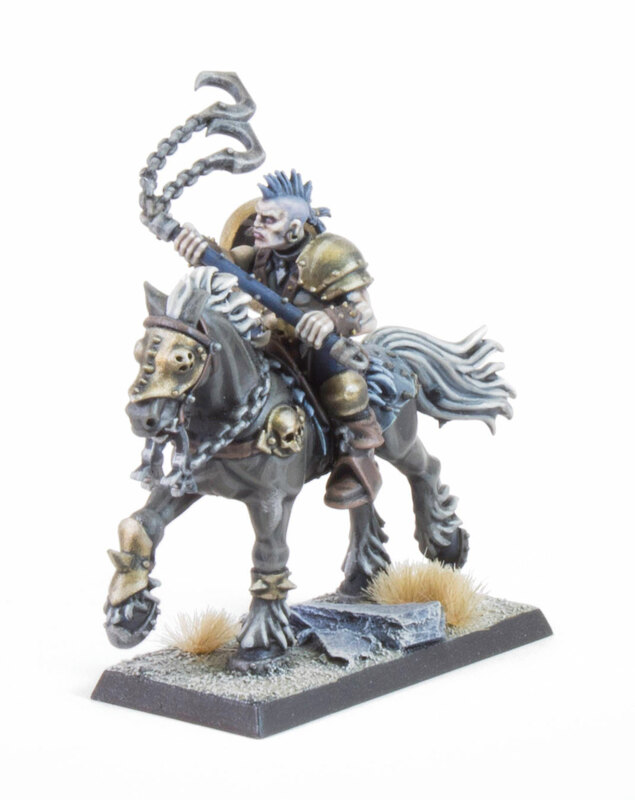 I already have another unit of Marauder Horsemen with javelins and axes so I wanted to converted this unit to make it stand out. The Hornblower got a head from the Chaos Lord on Manticore kit and a handflail from an Empire Flagellant. I think the bare heads gives this unit a real sense of personality (although considering all those flails swinging around they probably would have been better off with helmets!). Looking at the Age of Sigmar rules for these guys I’ll probably add a Damned Icon Bearer too at some point. 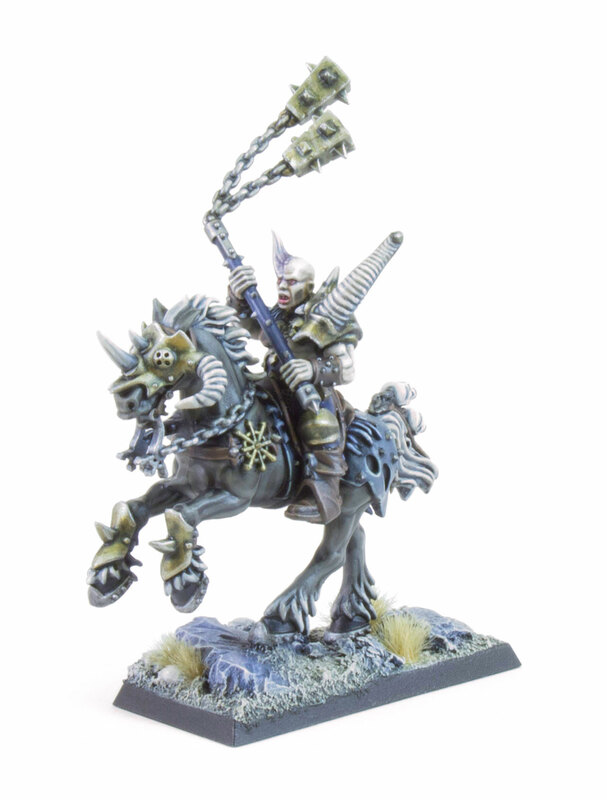 I did a bit of converting to the Horsemaster, starting by heroically re-posing his Chaos Steed so it is rearing up. I imagine that he has risen to fame in his tribe by hunting the mutated horrors of the Chaos Wastes and bringing back their corpses as trophies. To this end I rebuilt his shoulder armour with a baroque horn from the Chaos Helbrute kit to complement the pair that adorn his horse’s chamfron. 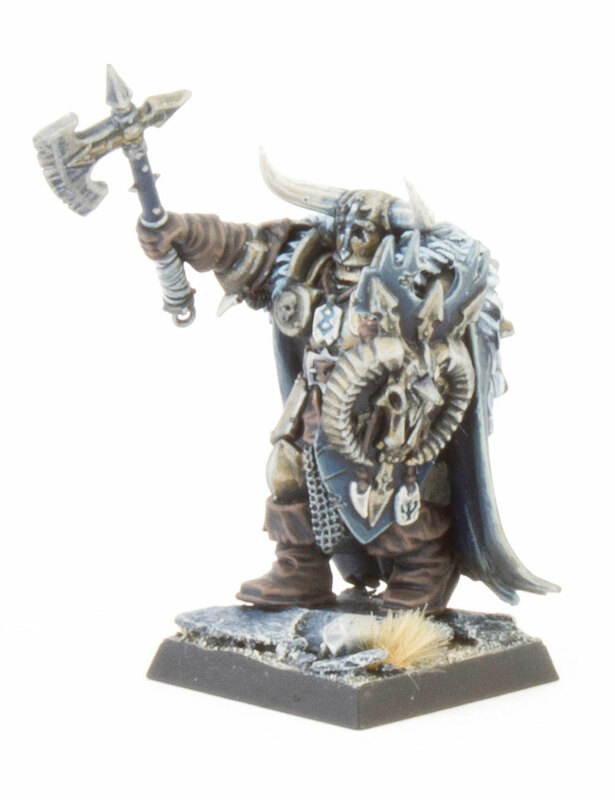 Clearly his deeds have earned the capricious attention of Tzeentch who has gifted him a twisted horn of his own – perhaps one day he will become the hunted not the hunter? I love the savage hooked flail on this guy. These models are really dynamic and full of character. As early CAD sculpts they have lots of very smooth areas but this is good to practice blending gradients on. 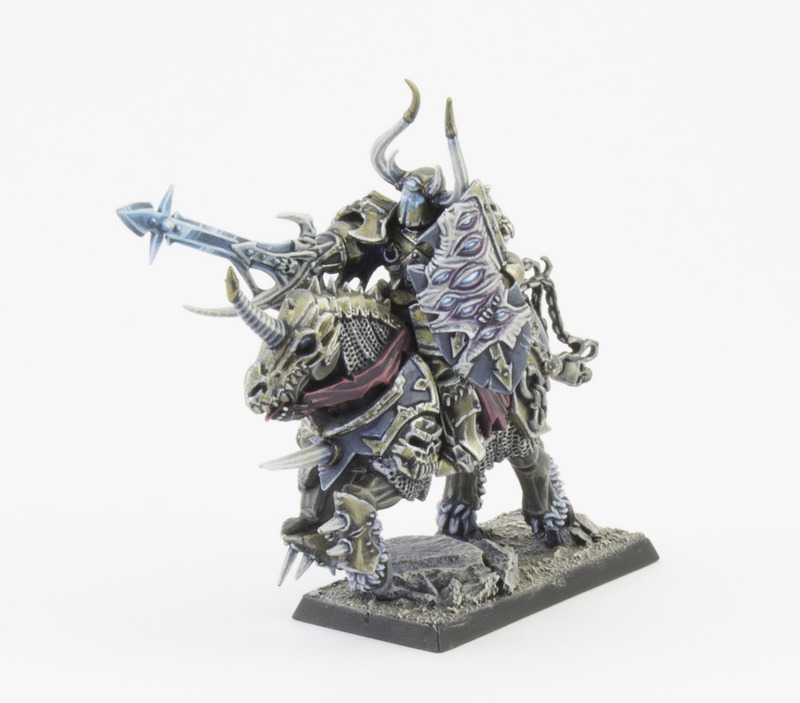 I’d love to get your feedback on these miniatures – please let me know in the comments. Do you reckon I should embrace round bases? 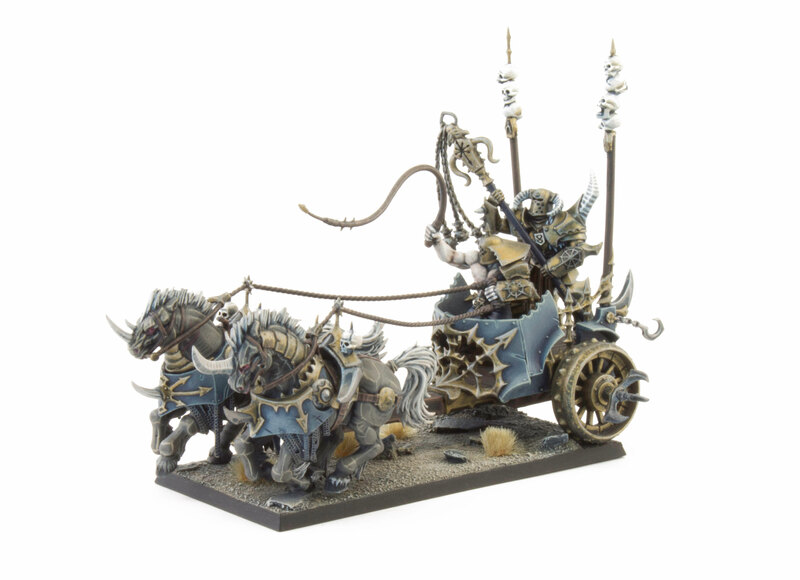 Hot on the heels of my Chaos Warriors is my Chaos Chariot. 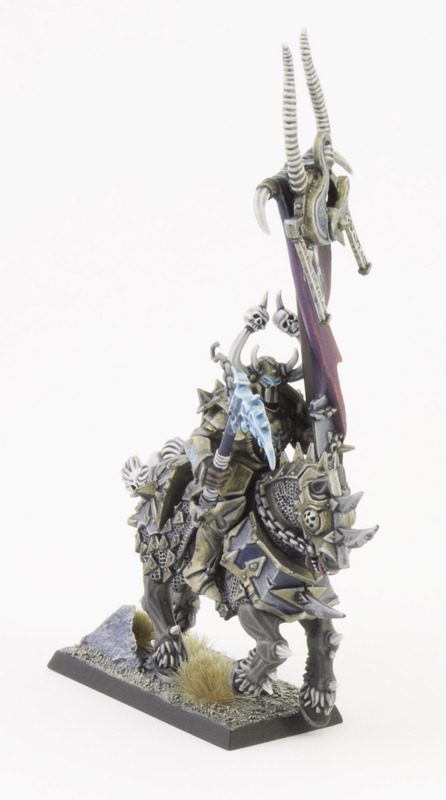 It’s a fantastic model and at the time of release, it really was a harbinger for the newer, chunkier style of Chaos that we’ve seen with the recent The End Times and Age of Sigmar kits. 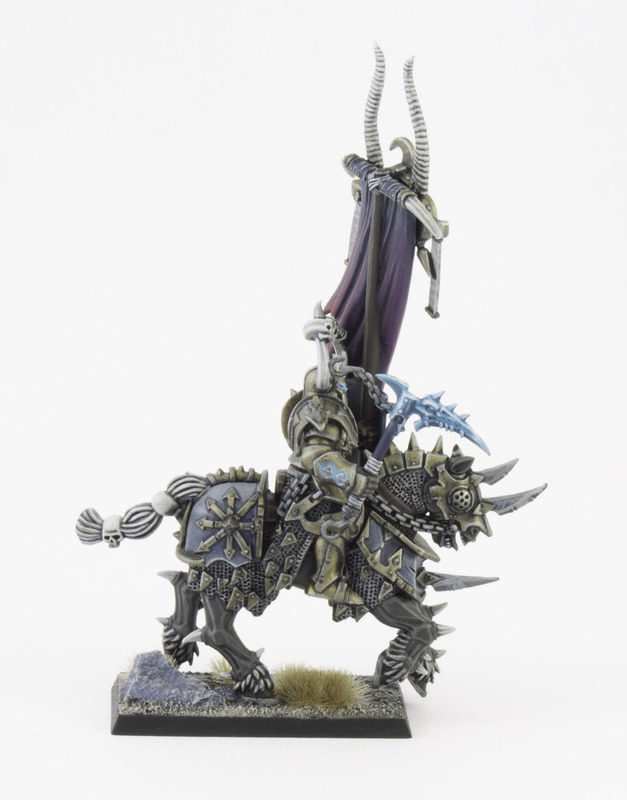 I painted the Chariot and War Steeds’ armour in the same way as the shields from my Chaos Warrior unit. The larger areas meant I could get some really nice blending on the highlights. I use several drybrushes then glazes of Vallejo Field Blue over GW Cantor Blue to build up the intensity. Edge highlights are done by adding white and Vallejo Dead Flesh to Field Blue. Based on this, I’m thinking of painting the Chaos Warshrine soon – what do think? Let me know in the comments. I magnetised the Charioteer so that I can replace him with other characters from my army. I used a classic Warrior of Chaos head to visually link him back to my other unit. 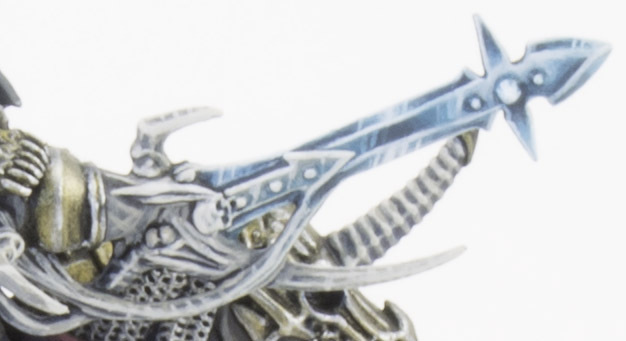 Zenithal highlighting techniques were used to add depth to the armour with glazes of Drakenhof Nightshade in the recesses. Given the angular style of the miniature this resulted in an almost cell-shaded look. 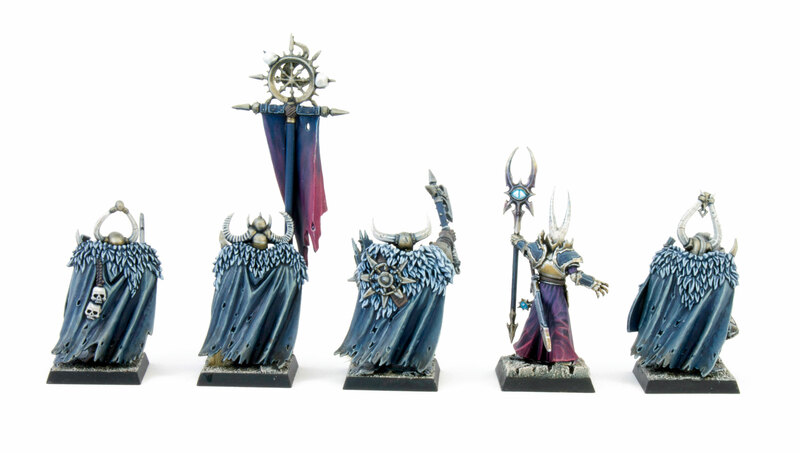 New Chaos Warriors of Tzeentch! 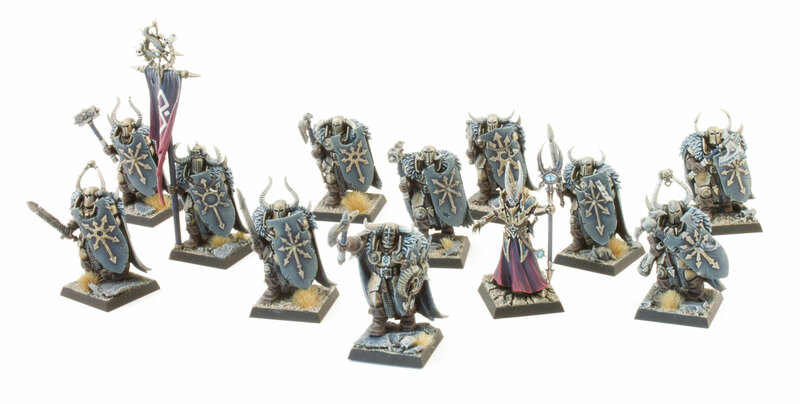 Shiny new Tzeench Chaos Warriors spotted! Well… not so new actually. I’ve been collecting a Tzeentch army for a few years and have been wanting to blog about it for ages. In fact, I’ve taken so long to that Games Workshop moved on and released Age of Sigmar before my army was ever ready for a game of Warhammer! Regardless, here is the first of many new posts about my enduring Games Workshop addiction. 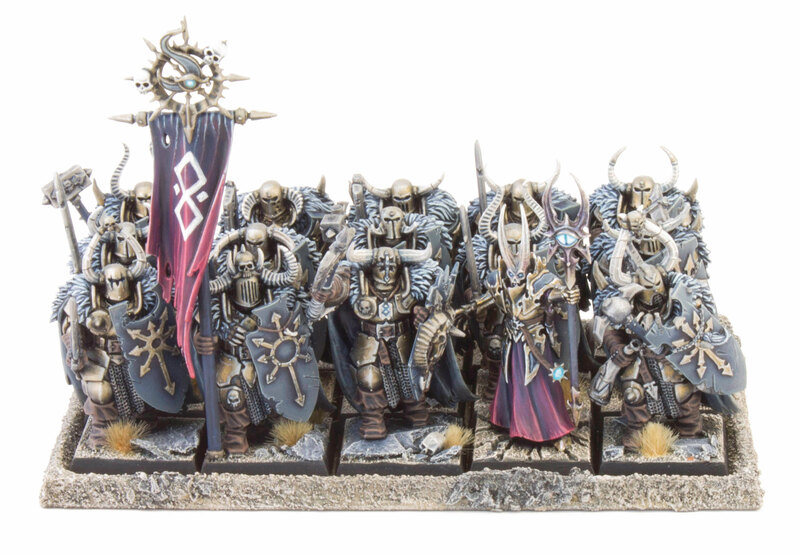 Dating back to 2004, the venerable Chaos Warriors kit still looks awesome. Each Warrior inscrutable under their horned helms, marching in lock-step behind towering runeshields; an inexorable force of ruin and devastation. With my unit’s dedication to Tzeentch in mind I decided on a very limited palette with lots of blue tones. The models started off with a dark blue basecoat – Cantor Blue or the old Necron Abyss. To offset the blue I opted for bronze armour and trim which I built up with drybrushes and glazes of Vallejo Bronze. Once the other base colours were in place I gave each model a liberal wash of Drakkenhoff Nightshade to give it a blue cast. Here’s the unit ranked up in the traditional way. To be honest I won’t miss ranking models up, but I still think it looks great. To denote the command models I opted for a splash colour of magenta – another colour typically associated with Tzeentch. 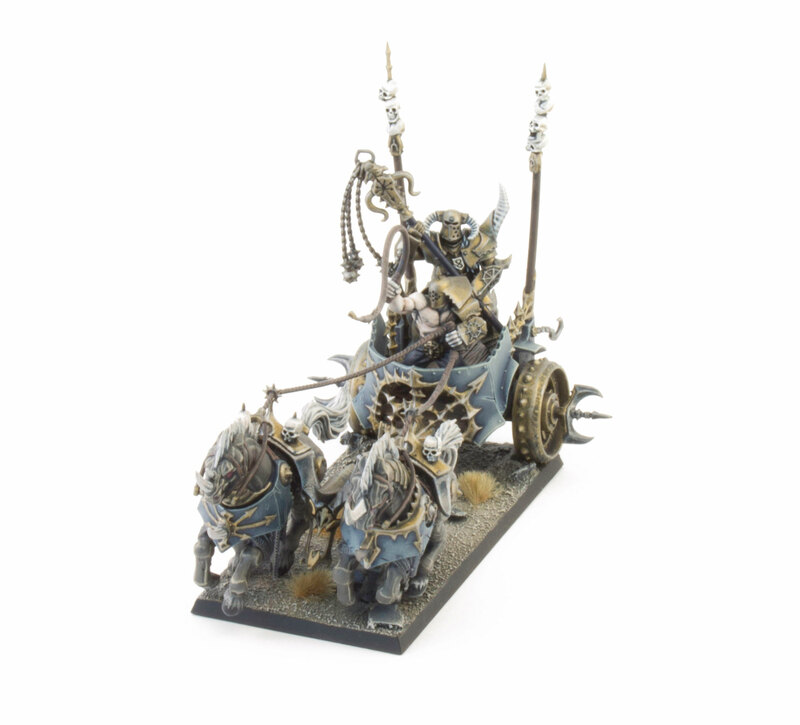 The banner designates their alignment to the Architect of Fate – a kitbash using a standard top from the Chaos Chariot and an icon of Tzeentch from the 40K Chaos vehicle kit. The Aspiring Champion is converted to make him a bit more imposing. 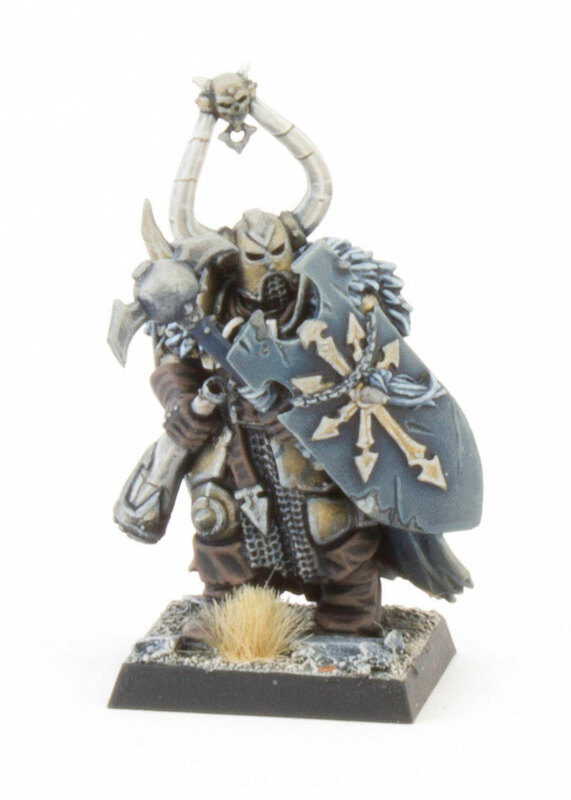 I particularly like the bone amulets hanging from his armour. 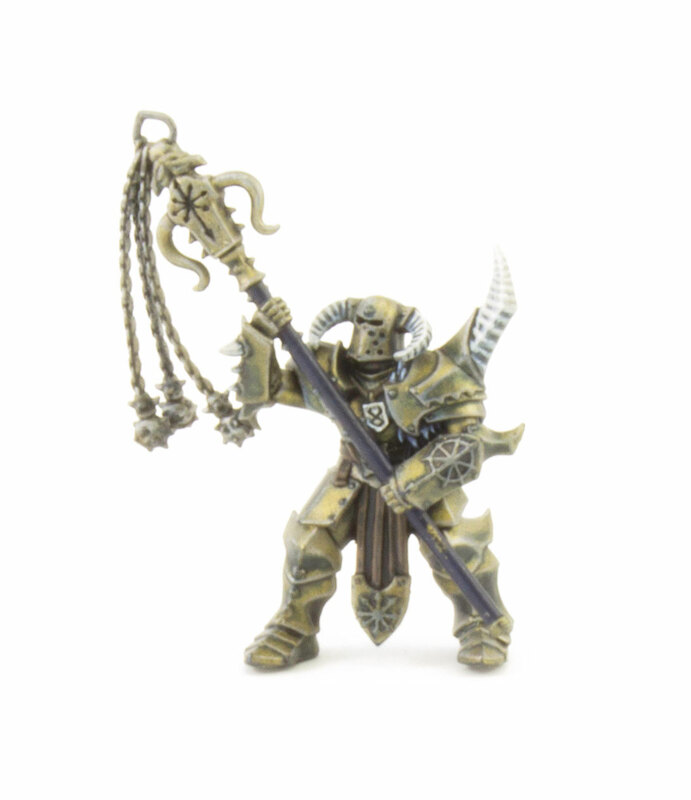 The freehand on the standard is based on the design found on the amulets around the necks of some of the Chaos Warriors. I figured it could represent the symbol of their clan, or a blasphemous rune of protection. The Hornblower glowers from behind his Runeshield. 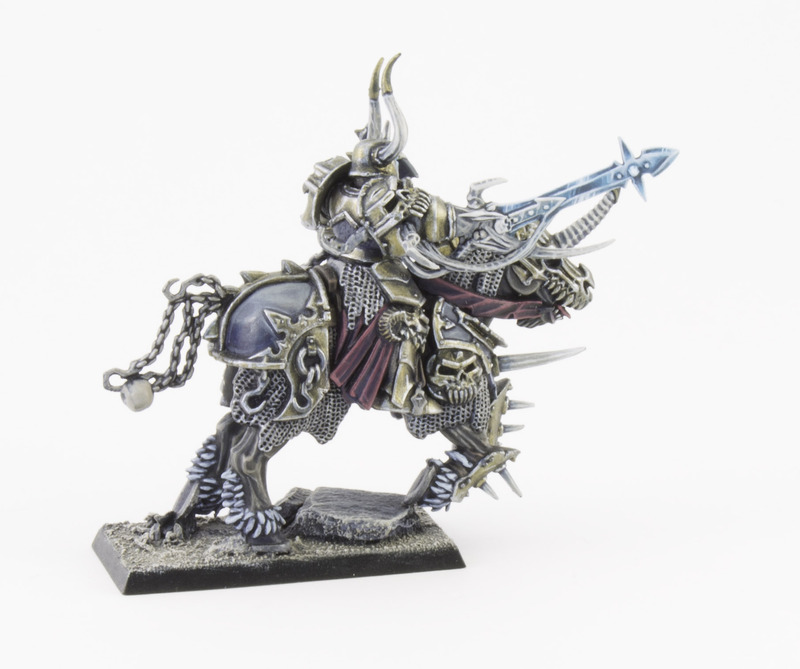 As I love the eerie anonymity of the Warriors I used a Chaos Knight head so that he can actually blow his horn without taking his helmet off! 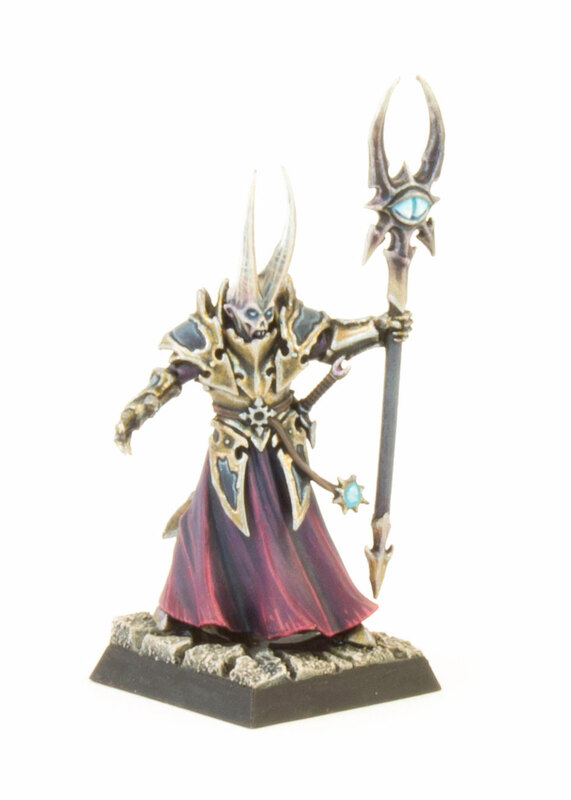 The Chaos Sorceror was great fun to paint. Throughout my army I’ve used a glowing blue for everything magical and arcane. At some point I may freehand some runes on his robe, what do you think? Here’s a view from behind so you can see the cloaks. I used cold, desaturated colours fitting for these Northern barbarians! I have several more units to share which I’m excited about. I hope you like them, what do you think?